Last time, I expounded on the topic of continuity – the weight of in-universe history (also referred to as background, lore, canon, or fluff in various circles) –getting in the way of telling new stories. Lots of words with a simple message: continuity is often only as much of an obstacle as you want it to be. Thing is, what do you do if the obstacle has simply become too big and too unwieldy to work with? Regardless of the medium, the favourite option tends to be the retcon. Retcon – or retroactive continuity – is the dark art of delving back into your setting’s past and deliberately altering some key event in such a manner that it changes the present. A retcon can change anything, from key events, to a character’s actions, their personality – or even their mortal state. Simply screwing up a bit of background and repeating past events incorrectly doesn’t count (and still goes on, despite the best efforts of writers and editors). It has to be a deliberate change. The most common application of a retcon is to bring someone back from the dead. That character you thought had been killed off at the start of Season Two? They’re not really dead. Actually, it turns out that they faked their death and hid in Brazil. No, wait, it was a clone. Or maybe it was an alternate universe doppelganger. Or a huge misunderstanding, involving a camera, a radio phone-in and a highly trained leatherback turtle. Of course, not every unlikely survival or resurrection is a sign of a retcon at work. Sometimes, one’ll be grafted into a story from the beginning – it might even be pivotal to the plot. In Babylon 5, Anna Sheridan was always going to come back from Z’ha’dum, in The Lord of the Rings Gandalf was always going to come back from his fight with the Balrog – these weren’t retcons, they were unfolding narrative. By contrast, the infamous return of Bobby Ewing to the long-running US soap Dallas after a year (everything from his ‘death’ onwards was explained as having been a dream) or Norman Osborn, the original Green Goblin, coming back to Spider-man’s rogue’s gallery after more than twenty years of being dead? (He was hiding in Europe, seemingly). These were retcons. So, why do retcons occur? Common perception, I think, is that it’s the writer indulging himself or herself: they’ve a story they want to tell, and to hell with what’s gone before. If it’s a creator-owned property, then this can be the case. 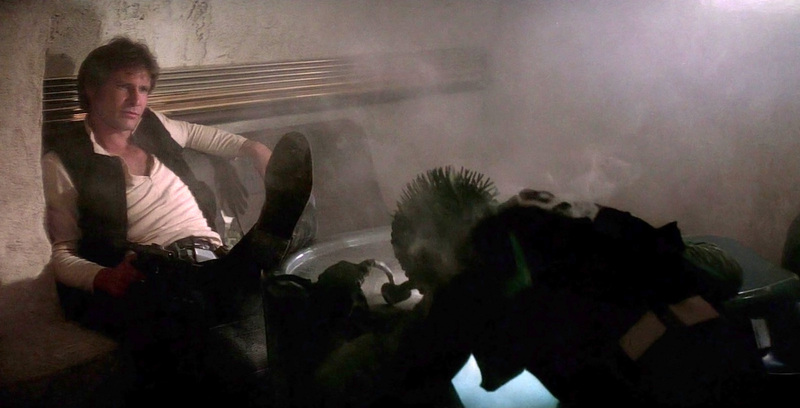 Han shooting Greedo first in the remastered Star Wars is a great example: George Lucas was in a position to better reflect his vision, and he did. As a general rule, the more money and the bigger the business riding on the story, the less likely it is to be the man or woman with the word processor who makes the call. Bobby Ewing came back to Dallas because actor Patrick Duffy wanted to return to the series, not, I’d imagine, because the writers of Dallas had a burning desire to write off a year’s worth of stories as a ‘dream’. In superhero comics (where death definitely has a revolving door policy) characters famously live and die through editorial mandate, rather than writers’ wishes. Ultimately, the vast majority of retcons are about money: more people will watch/read Story A if Character B is brought back, or if Shocking Revelation C occurs. They’re often a means of re-engaging a flagging audience, or to patch issues (real or perceived) with the characters or setting. This being the case, there’s something delightfully self-aware of Marvel’s current Original Sin event, which looks like it exists only to give free rein to fresh retcons across their entire line. Are retcons bad? Certainly for many ardent fans, they’re a heinous evil because they overturn months or years of established backstory. For the obsessive compulsives out there (amongst whose ranks I count myself) it can be maddening to think that certain things simply did not happen, that certain episodes, stories, comics or books no longer ‘count’. It cheapens the investment of time and money we put into the stories in the first place. However, I reckon that retcons are neither innately good or innately evil. Like all storytelling tools, it’s how they’re used, and how well they’re implemented. Weaving a good retcon – one that fulfills the commercial and narrative goals, whilst still being respectful to what has come before – is hard work. Not all writers and editors are equal to the task of negotiating years or decades of backstory – especially in overgrown and untended intellectual properties. Few retcons are perfect, and even fewer are universally well-received. Personal taste plays a huge part. If Story A is replaced by Story B, then a fan’s opinion of the instigating retcon is likely to be based on whether they preferred the old or the new version. The more invested in a character or setting a fan is, the more probable that they’ll dislike the change simply because it’s not what they wanted to happen. For myself, I enjoy retcons that leave a setting richer for their existence, that add greater depth to the characters and settings I know and love, but ultimately – and this is the important part – leave the essence of that character and setting fundamentally unchanged. In other words, I like retcons that open up new story opportunities. Character A is still a hero after the retcon (even if he did look awfully villainous for a while) he’s just carrying more emotional baggage than we ever knew. On the other hand, I hate retcons that don’t have an obvious internal logic, or are wearing their financial motivations a little too plainly. Worse, however, is what I’ll call retcon tennis. This is where successive creative teams try to establish their definitive take on a character or setting by reversing what came before. DC comics’ Hawkman is perhaps the worst example I’ve seen of this, flip-flopping back and forth between a reincarnated human and an alien enforcer. (For the record, I prefer the reincarnated version.) Worst of all is a retcon that causes confusion, leaving the readers or viewers wondering what the hell the ‘true’ version of the story is supposed to be. Geoff Johns’ incredible Green Lantern run is full of what I’d consider to be well-crafted and beneficial retcons. It constantly reinterprets the past (from Hal Jordan’s origin onwards), paving the way for new stories without notably diminishing the original consequences of those events, or altering Hal’s character. By contrast, there’s a Spider-man story called One More Day. If you’re reading this blog, chances are you’ve heard of this already. I’ll not go into detail (others have already discussed it far better than I ever could) but the retcon in question is lazy, tortuous and generally insulting to the reader – made all the worse because both the writer and the editor are capable of so much better. Love ‘em or hate ‘em, retcons are vital tools for any form of serialised storytelling: used properly, they can reinvigorate a franchise. However, they’re not the only tool in the box. In an age of increasingly short attention spans and reliance on brand recognition, another (arguably darker) art has come to prominence: the reboot. Posted in Featured Blogs, Thoughts from the Tower and tagged Star Wars, Writing.